The menswear fall 2016 season commenced on January 8 in London. 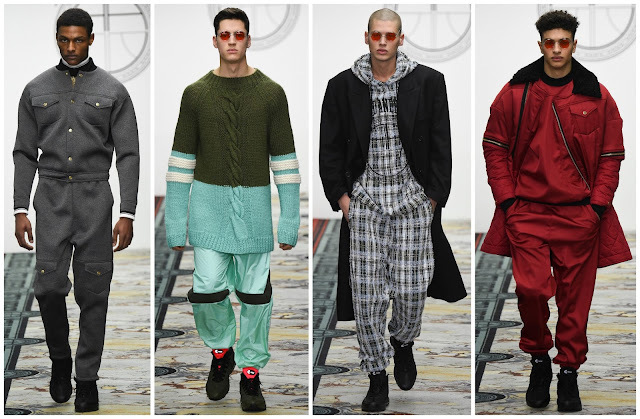 London Collections Men is now in its eight season (formerly it was the last day of the womenswear week). Founded by British GQ’s Dylan Jones, the week is the first stop in the men’s international fashion calendar. It’s schedule features some of the brightest names: Craig Green, Agi & Sam; as well as the industry heavyweights: Alexander McQueen, Burberry and Coach. For my inaugural post on the menswear season, I’m going to dissect Danish designer Astrid Andersen’s collection. Presented during London Collections Men, Andersen’s menswear show is one of the highly anticipated slots on the schedule. Her “premium casual wear with a sports inspired aesthetic” was in full effect in this collection. Looking to the ski slopes of Sölden, Gstaad or Courchevel, the resorts were certainly on Andersen’s mind. An oversized army green and pistachio sweater, with a knotted wool detail, was tailored in a way that it didn’t look obnoxiously oversized. The trousers worn with the look, also in a pistachio hue, would be perfect for snowboarding. Mittens, creeping their ways up the arm, reached the elbows. A crimson winter jacket, one of the closing looks was another brilliant look. Logos are ever-present at the London shows. Tactical business moves, yes. Does that mean it has to be black text on a white background? No. Andersen embossed her logo in black against black sweaters, army green quilted hoodies, and check zip-ups. On the breast of many pieces, the circular logo was also featured. There was tinges of lad culture in the collection. Easily imaginable is a “lad” gallivanting around a big city or small town, decked out in crimson baggy trousers, a quilted bomber jacket or an oversized logo sweater. Also distinguishable were grey, wool tracksuits. A recurring trend in London has been the smothering of the collections in sensuality. Yes, that was subtly present in this collection. There’s something about Andersen’s collection that is distinctly masculine in its ways, but not obtrusively. It bears subtle feminine touches. Because of that, this collection will appeal to those interested in fashion or not.